This week we attended our 3rd visit to the cardiologist. We still haven't gotten used to finding it on the big, confusing, under construction hospital grounds, but we're getting there. Once inside, we pretty much have our system down. 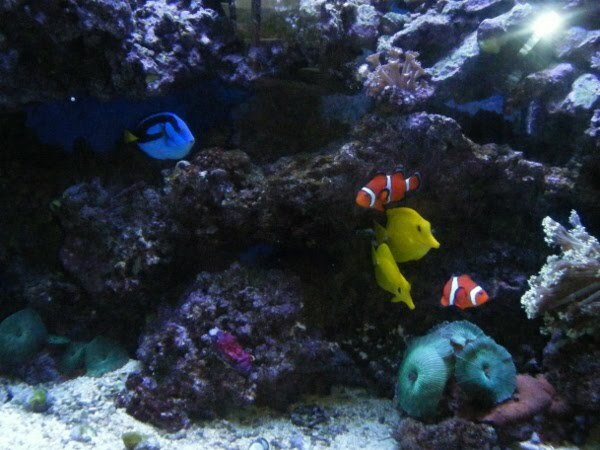 We arrive and admire the Finding Nemo fish tanks. Seriously, they are designed to follow the movie and have most of the characters in there. They are gorgeous! Daddy and Sasha even got to see them clean the tanks today. We sit and... wait. Oddly, I think Bubble Guppies is usually on the television when we get there. The wait can be kind of long sometimes. When they finally call Spencer back, I take him alone. The first time, Spencer just lay loose on a pillow and ate from a bottle. It was a great way to keep him still. The second time, I forgot to bring one - despite the doctor specifically suggesting I do so. This week, I brought one! 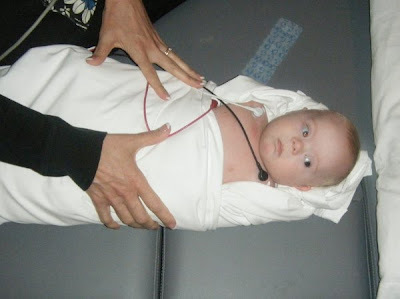 It was also the first time they swaddled him for the ultrasound. His arms were basically strapped down to his sides. As you might expect, the U/S room is a very quiet, slightly dim room. Today Spencer went to sleep while eating and slept through much of the exam. It takes about half an hour. Toward the end, I help hold his head tilted back so that the U/S tech can get a top view of his heart. Having him sleep is very good for visual clarity on the U/S. The U/S tech escorts Spencer and I to another room where our Pediatric Cardiologist's nurse checks Spencer's blood pressure and oxygen. She will also listen to his breathing if she notices or we report anything out of the ordinary. We usually have someone come in to do an EKG at this point as well, but not this week. I ask the nurse to fetch my family to wait in this little room for the doctor. He has to review the U/S before seeing us. When he comes in, he turns off the little TV so he can listen to Spencer's heart and breathing. He talks with us a little about the day's findings. Then he always has to step out to do "one more thing" before coming back in and concluding the visit. Before excusing us, he always goes on about how impressed he is with Spencer. He says we are very lucky (I know it!). Spencer is very alert and responsive. We schedule the next appointment on our way out and Sasha receives a lollipop. After the very first appointment, she remembers and starts requesting it when she sees the desk! That girl has great memory! 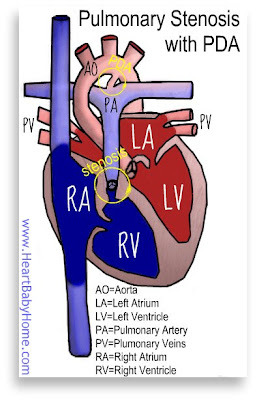 That clarity (in the U/S while Spencer slept) allowed them to see that Spencer still has a PDA (Patent Ductus Arteriosus) but it is tiny and not a problem at all. Newborns all have this vein, but most lose it at birth. It just "goes away." Spencer's did not, which happens sometimes. It may have been the root of the oxygen desaturation problem he had during his first week. Spencer's pulmonary hypertension has not worsened this time, but it has also not improved. No news is good news? They also noticed this time that Spencer has a narrowing of the pulmonary artery. This is known at pulmonary stenosis. The cardiologist did not seem concerned by this. I am now wondering if the two are related. I didn't think to ask before we left the doctor's office. The doctor still hears the stridor in Spencer's breathing, but suspects it could simply be from a narrow airway. Babies with DS tend to have smaller airways, ear canals, nasal passages, etc. Spencer does not have small nasal passages, but does have small ear canals. I wonder if the narrow airway might have something to do with the gasping Spencer does in his sleep. This week we learned that this office (the only Pediatric Cardiology office in town, I'm lead to believe) has about 2000 patients with Down syndrome. Wow! Yes, heart defects are very common among people with DS. Spencer seems to be coming up with the rarest of heart issues among them. We will continue to monitor the pulmonary hypertension very closely. Only this time we don't have to go back for 6 weeks. That is slightly reassuring, but also a little worrisome. We were told 2 weeks last time, were scheduled for 3 weeks, then we had our appointment rescheduled for the following week. We will also need to get a new chest x-ray just before out next appointment. We're being sent to a special imaging center that offers micro-dose x-rays, though. Our cardiologist said that would be better for Spencer and I'm thrilled to reduce as much of that stuff as possible! We see the pediatrician next week. It's good to get the update. I'm glad it's all being monitored and that nothing seems too urgent. I hope you can get it all resolved soon so you know what's what and where to go from there. I had to laugh about the lollipop and Sasha. That's exactly the kind of memory Mikko has, too! personal statement for cardiology is a great reference guide for cardiologists, surgeons and physicians alike. It will explain procedures and current state of knowledge and clinical practice.